The Triflow Nightingale system boasts a traditional and sleek design, allowing for cold filtered water to be delivered without cross-contamination through a dedicated waterway within a single spout. This cost-effective design is the perfect accessory to update any kitchen. Use with our Katadyn filters to ensure great-tasting, freshly-filtered drinking water. Fluhs™ 1/4 turn precision ceramic valves. 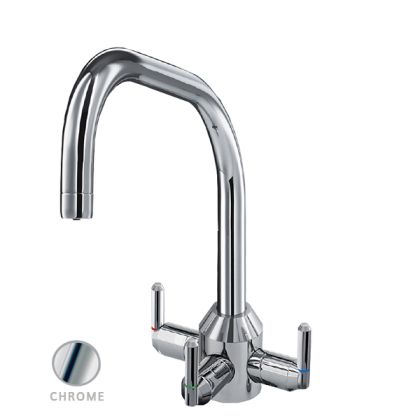 Dedicated waterway within a single spout for cold filtered water delivery, that avoids cross-contamination. High grade polymer filter housing unit. Bearing rings and ‘O’ seals are fitted on handles and spout to ensure maximum durability. Filter cartridge is easy to change — no tools required to open the filter housing unit. Two year warranty on entry level plastic filtration unit.